Representing years of in-field research and innovation, the INVADER V3 boasts a slick, other-worldly design unrivaled by any other drum practice pad on the planet. Featuring a truly authentic 360º patented RIM element and our incomparable Darkmatter playing surface and presenting a revolutionary feel and articulation one must experience to believe. The INVADER heralds a paradigm shift in pro-percussion practice implements that will change the way you approach the drum, forever. This industry-standard pro-rudiemental drum practice pad has been carefully engineered to duplicate both the physical functionality and realism of a true rudimental snare drum. This elegant and cutting edge device has been created specifically for drum and bugle corps, scottish pipe snare, orchestral and kit-based rudimental percussionists dedicated to honing their essential rudimental chops and maximizing their performance excellence, off the drum, in practice settings. 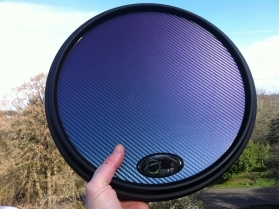 "OffWorld Percussion has created a product in the Invader V3 that stretches access all areas of personal development in snare drumming technique. This full size pad is not only a complete pleasure to play, it also takes you to a new level of understanding your technique and the progress you have made to perfecting first class snare drumming skills. This was a long time coming, but now the Invader has arrived."